Though it is just two hours south of Chicago and 35 miles from Peoria, Mission Oak Inn feels like you’re blissfully miles from the hustle and bustle of daily life. Here you will find luxury mixed with country comfort, and a warm and welcoming place to settle in for a few days. 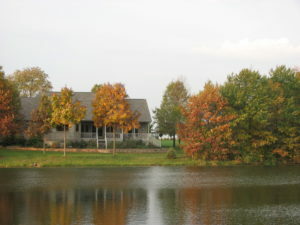 The Inn, which opened in 2006, is located in Henry, Illinois, on 120 acres that has a stocked fishing pond and lovely gardens, a setting where deer, fox and other creatures often call home. Step inside and you’ll see rich oak and mission-style design. Owners Denny and Jan did much of the interior work themselves, and Denny—who is an accomplished woodworker—created everything from the coffered ceilings to the cabinetry and furniture. If cozy fireplaces, two-person whirlpool tubs, and plush bathrobes sound appealing, you’ve come to the right place. Mission Oak Inn’s two guest suites have all that, plus custom-built queen beds, reclining loveseats, and all the little extras you expect in a luxury hotel. While Jan takes care of the business side, Denny mans the kitchen, turning out fabulous breakfasts with entrees such as French banana crepes and eggs Florentine. 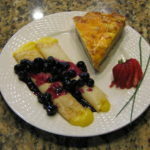 A complimentary homemade dessert is offered each evening. Mission Oak Inn has a range of special packages, making it even more tempting to get away for a few days in the country. Among these are a Cooking Package that includes personal instruction on cooking your favorite inn dinner, breakfast and dessert; and a Fishing Package that comes with a pontoon boat and picnic basket for two. With a convenient location near to popular Starved Rock State Park, and easy-driving from major cities, Mission Oak Inn lets you get away from it all, and still be close to the activities you enjoy. 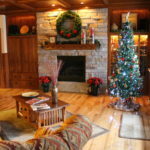 This entry was posted in Illinois Bed and Breakfasts and tagged Illinois B&B's, Illinois Travel, Starved Rock State Park by admin. Bookmark the permalink.